Part of the process we learned this time around is that it's better to break down the cassava with a old-fashioned food-mill rather than the vita-mix -- it makes for a fluffier dough with great texture. 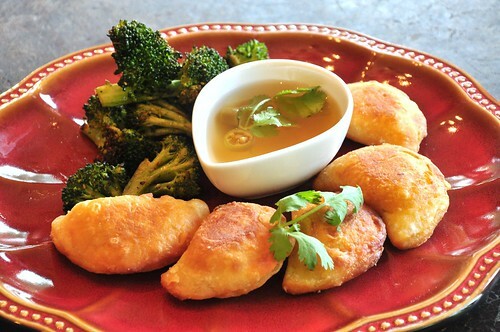 The pineapple vinegar recipe is from Daisy Martinez, and was used a dipping sauce for he empanadas. The broccoli was tossed with olive oil, salt, pepper and Mexican oregano and roasted in the oven at 450F for 15 minutes. Taking a page from our tortelloni experiment last month, we used the wonton wrappers as the pasta again, this time filled with a tofu ricotta (tofu, nutritional yeast, salt, pepper, parsley) and wilted spinach. We used two pieces of the wonton with filling in between, sealed them with a cornstarch slurry (1:1 water:cornstarch) and used a ravioli cutter (a.k.a. fluted pastry wheel) to seal them. They were boiled roughly 2 minutes in boiling salted water and finished by tossing them in a warm pan of melted soy margarine. 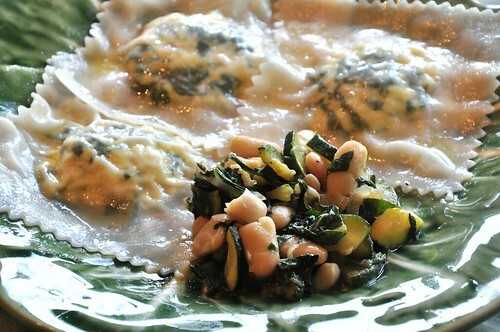 When looking for side dishes for the ravioli, there weren't many choices. 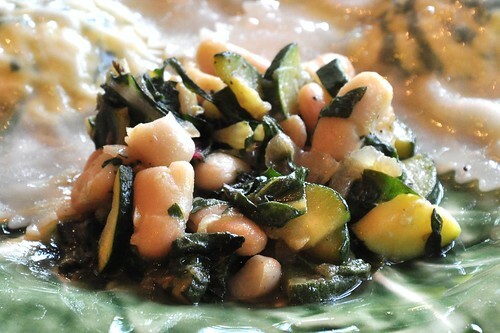 The chard needed to be used, ditto, with the zucchini -- so we added some cannellini beans, onion, garlic, olive oil, nooch and pepper. For the soup (which serves four people), we first soaked four ears of corn in cold water for 10 minutes, then grilled them in the husk. After the corn was done cooking (about 10-15 minutes or all of the husks are blackened) we removed the kernels with a knife and set those aside while you make the corn stock. Take the four cobs, break them in smaller pieces. In a stock pot, add 1 tsp. of olive oil and the cobs and cook for 2-3 minutes. Add four cups of water, and bring to a boil. Reduce the heat to a simmer and reduce down to two cups (about 40 minutes) then strain. In a saute pan over medium heat, we added 1 tbs. of olive oil, a small shallot and 4 cloves of garlic (both minced), the grilled corn, salt and pepper and cooked it for 2-3 minutes to sweat the shallots. Next, add the two cups of corn stock, plus two cups of soy/rice/almond milk. Carefully add the mixture to the vita-mix and puree. Strain the soup back into the pot and check for seasoning. Keep on low heat while you get the rest of the toppings together. 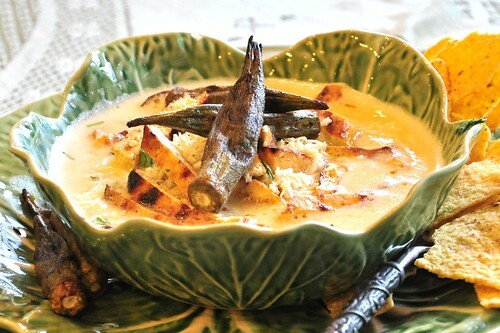 Pour the soup into a serving bowl and top with a couple of tablespoons of Daiya Mozzarella, grilled tofu & okra. Tonight's meal was based on another orphan food score, this time three enormous containers of English Peas, that, much like the Fava Beans last time, didn't get sold over the weekend. To be honest, we didn't see anything wrong with them physically. As it turned out, there was one pod that was unusable in the entire bunch. The broth for the risotto was made using our regular veg broth with the addition of the shucked pea pods and asparagus trimmings, cooked together for 20 minutes, then strained, to give the broth that springtime flavor boost! In a large saute pan, add the olive oil over medium heat and sweat the shallots for 2 minutes. Add the rice and stir to combine. When the rice begins to look "chalky" (2-3 minutes), add the white wine (off the heat) and cook until it's almost evaporated. Add salt and pepper to taste. Add half of the stock (three cups), stir to combine and and let it cook for 7-8 minutes. Then add the second half of the stock (three cups) and cook for another 7-8 minutes. Add the nutritional yeast, soy margarine, salt and pepper, stir to combine and check to see if the rice is al dente. If not, cook for an additional 1-2 minutes. 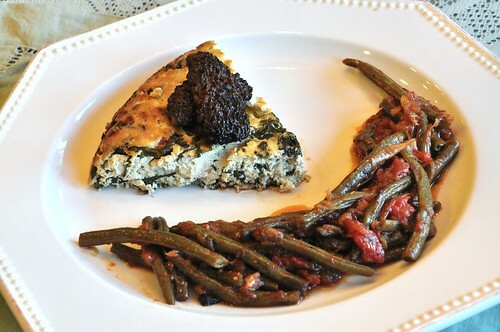 Check for seasoning and serve, topped with the morel mushrooms. In a saute pan over medium heat, add the olive oil and soy margarine. 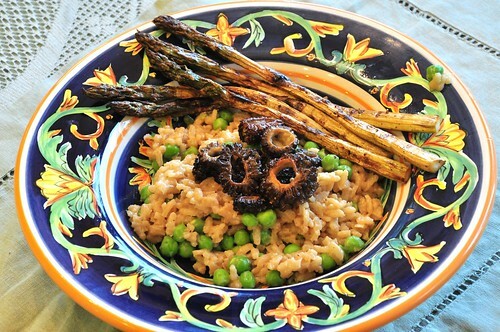 When the margarine has melted add the sliced morel mushrooms and cook for 5-6 minutes, turning occasionally. At the end of cooking, splash with the tamari. Add to the top of the risotto. 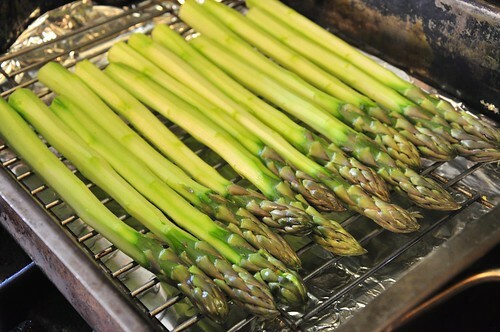 The asparagus were fairly thick, so we peeled them. Next they were smoked with oak chips for 15 minutes, marinated with olive oil and tamari for 10 minutes and finally grilled. When our daughter not only eats three entire stalks of asparagus (she's more of a "tip only" person), and then asks for seconds, well... let's just say they were pretty good. 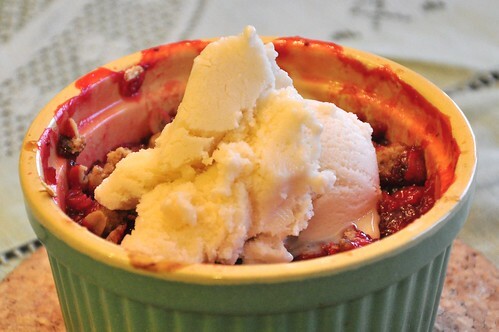 As for the dessert, the rhubarb and strawberry were both at peak flavor, so it's best to get out of the way and let them shine in a simple crumble. 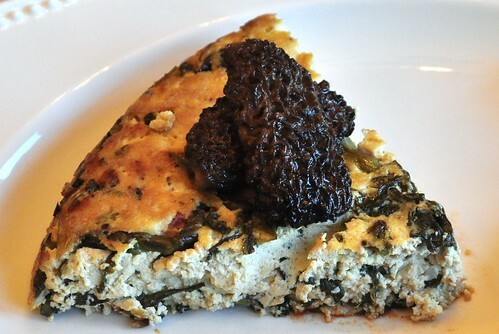 We haven't made a frittata in a while, but the combination of some lovely thin asparagus and morel mushrooms (with crumbled tofu) in a cast-iron pan was too good of an idea to pass up. The loubie used green beans this time around, slow-cooked in a tomato based sauce.